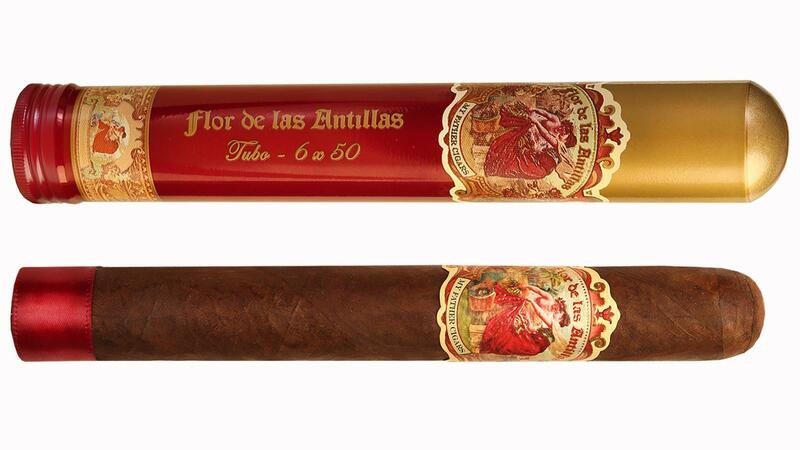 There's a new size coming to the Flor de las Antillas line and it's going to ship in an aluminum tube. Aptly named the Flor de Las Antillas Tubo, the cigar is made with the same tobacco blend as the other sizes in the brand, only this new 6 inch by 50 ring gauge cigar isn't box-pressed like the rest of the line. Rather, it's a traditionally rounded parejo-style cigar so that it can fit into the aluminum, screw-cap tube. The tubos will come in packs of three and retail for $24 per pack. This release marks the first time that brand owner My Father Cigars has ever released a cigar in a tubo. Flor de las Antillas is a Nicaraguan puro with a sun-grown wrapper. The brand's name means "Flower of the Antilles," which is a reference to Cuba—the largest of the Antilles Islands. The Flor de las Antillas Tubos should reach retailers by late February. They are rolled at the My Father Cigars, S.A. factory in Estelí, Nicaragua. This article first appeared in the February 2, 2016 issue of Cigar Insider.